Google regularly rolls out updates to the dialer app on its phones via the Play Store. In the most recent update, the changelog claims "bug fixes," but many users are reporting it introduced a new bug. 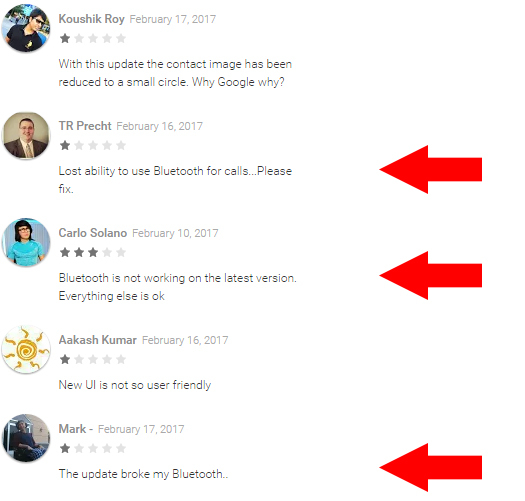 Dozens of reviews on the Play Store say the February 10th update broke Bluetooth calling. Those affected by the issue are unable to make calls over Bluetooth—audio continues to happen on the phone rather than the connected BT device. Other Bluetooth features like audio streaming appear unaffected. In addition to all the Play Store reviews, AP team members have experienced this first hand. Because the Google Phone app only runs on Nexus and Pixel devices, that's where the issue is confined. It seems to have started after the last update to the Phone app, but rolling back the app doesn't fix the issue. We can't rule out a separate cause, but it's possible the update broke something in the system Bluetooth settings that can only be fixed with another update. We can't be sure what's wrong, but something certainly is.